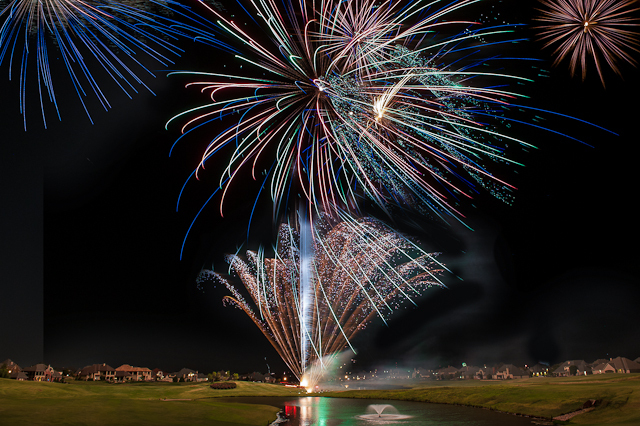 Rose Creek held its’ annual 4th of July fireworks show last Wednesday evening and, as usual, it was spectacular! The show was a full 30 minutes long! Funding was provided by both the homeowners and Tour 18 for the $10,000 show. Many Rose Creek family members and friends line the streets for the Rose Creek parade beginning at 9:00. Kids, dogs, babies, strollers, adults, decorated golf carts and bicycles provide red, white and blue for the annual parade. At the end of the parade route, the kids enjoyed popsicles. It is so great to see the neighborhood at Rose Creek celebrating the birthday of this great country and the heritage of our wonderful state. The families spent the afternoon at the aquatic center and that evening came to the clubhouse for a barbeque and kids talent show. Rose Creek, you had a spectacular fireworks show! Thank you homeowners and Tour 18 for a great 4th. See you next year.